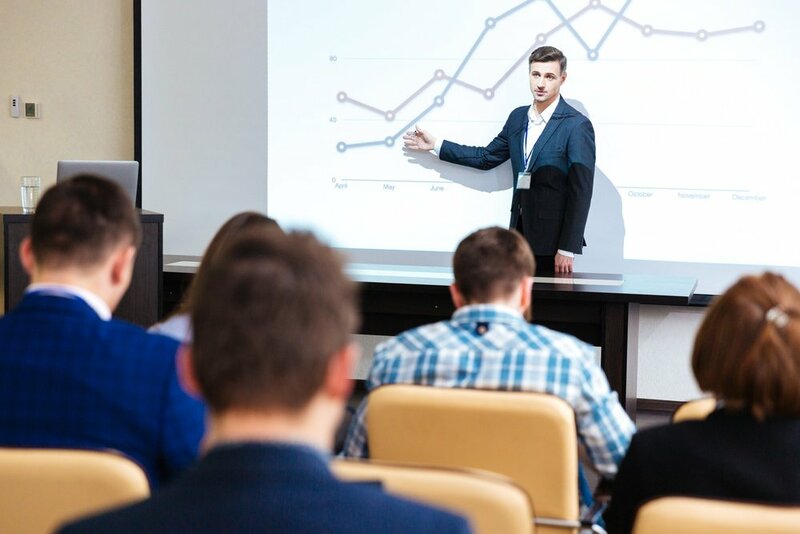 Whether you use PowerPoint, Keynote, Haiku Deck, Projeqt or Prezi, slideshow presentations are one of the best ways to grab and keep the attention of an audience during a talk. It takes some of the stress off of the presenter by giving everyone something else to look at, and it helps to hone in on the key points that the presenter is trying to make. Not only are slideshows a great way to tell a story in person, they are also an effective way to communicate with an online audience. While blogs, articles, whitepapers and ebooks are excellent tools for establishing thought leadership and delivering your message, slideshows can be a great way to mix things up a bit. Especially when - according to the Social Science Research Network - 65 percent of the general population are visual learners. So, how can you spruce up your slideshows and make them look as professional as possible? I've got seven strategies that can help you out. Before you even start fleshing out your presentation content on paper, make sure you have a good idea how you will be creating it and where you will share it in the end. There is definitely no one "best" option. Check out each of these to understand more about their strengths and weaknesses and how they differ from a user experience standpoint - then, pick the one that you are most comfortable with because that's the one you're most likely to use. It's not enough to just create great content, you've also got to let your audience see it ("if the tree falls in the forest"...). While the apps and programs listed above are super helpful tools when it comes to creatingn great presentations, they won't help you share them..
Are there other tools out there that you like to use for building or sharing presentations? Comment below, I always love to learn about new and amazing apps and programs. Once upon a time, great presentations were all about a few strong bullet points on a simple background. These days, the ante has been upped and design is almost as important as the content and that means having a great template for your presentations. Sure, you can build your own template from scratch – or if you are really daring, from Powerpoint's built-in templates – but why waste your precious time on something that you can pay to download online from a professional template designer? This goes back to why we often choose to use stock imagery: time is valuable, and there is usually no point reinventing the wheel. That being said, if you plan to use a template, be sure to find one that suits your needs and you can utilize for all future presentations (after all, the key is to keep your brand consistent). Color - How easy is it to swap colors? While many templates offer multple colors, what you really need is one that you can edit to match your brand's colors. # of Slides vs. Slide Design - Most templates have different focal points. One may have many charts and graphs while another is icon-heavy. Only pay for what you need. Don't buy a 60-slide template if you don't need those 10 slides with mobile device mockups. Visualization - By looking at the template demo, can you imagine how well your content and brand will fit into it? The truth is, even when you buy a template, you are going to need to spend some time getting it to match your branding and rearranging it based on the content you will be using. If you can't see how a template would work well with your usual slide content, it probably isn't the right one for you. Price - Don't pay more unless it's worth it. Template demo slides and specs should be enough to prove whether the template will work for you or not. Utilizing your brand standards in your presentations is a sure way to keep your content looking clean, as well as to keep things at a professional level of design and clarity. When you are confidently using your brand’s colors, logo, and fonts, you will help to send a clear picture of who you are and where your company stands. Now while I agree with most of the points made by Hubspot in their own blog on improving presentations, I take exception with one of them. In this case, I actually do believe it's good to have your logo on every slide. "If you are 20 minutes into a presentation and your audience doesn't know who you are and what company you are with, then you have a major problem. This problem isn't going to be solved by placing your company logo on every slide in your presentation." I agree. Your brand should be able to speak for itself. However, just like you have your logo on every page of your website, I find it helpful to include a small (and I mean small) version of your logo in one corner of your header or footer. I personally like it placed opposite the slide number, greyscaled and slightly transparent so that it is there, but not in your face – or in the way of your important content. Having your logo on every slide is a great way to have that subtle, helpful reminder of your brand or message throughout the presentation. This is also a great place to include a hashtag ifi you want your audience to tweet during your presentation. One of my favorite parts of the INBOUND 2014 conference was live-tweeting at the presenters and using their personal handles and hashtags. Obviously #INBOUND14 was the big one, but if not, speakers would often include such info on each slide. In addition to using your brand colors and your logo consistently, it is also important to ensure that the images you use not only make sense in terms of the content, but also provide a glimpse into the message you are trying to convey – and I don’t mean the presentation, but the air of professionalism you want others to see. "But what about that bright pink 3-D heart with the Cupid arrow that I was using for my slide on lead generation?" Clipart and images snagged from a quick Google search will not ever help you to prove your worth to a client. Yes, they may still get the point across, and yes, not everyone may be offended that the 50x50 pixel image you found is now stretched grotesquely across your 1000 pixel wide slide. But is that really sending the right message? Not only will the image quality be low, but odds are, you don't have the legal right to use it in the first place - and that's just bad business. Find images that relate to your brand, and even better - find images that have some degree of consistency and relate to one another. The same goes for illustrations or icons. Be sure they work well with each other, and with your content and brand. You don't have to have an image on every slide. Instead of using an image just for the sake of it, let the important information you have on each slide breathe. This makes it easy for your audience to easily digest your content. Keep your slides down to a single idea. Busy, detail-heavy content like charts, tables and graphs should have an obvious point. To quote the mantra of a friend of mine: Keep It Simple, Stupid! Put simply, keep it legible. Your presentation may be viewed from a far distance, so don’t give your audience any further eye strain. As long as you are keeping things simple, and only focusing on one key point per slide, the number of total slides in your presentation won’t matter. Your 10 minute lowdown on how social media can boost sales will still be 10 minutes whether you have 5 cramped and confusing slides or 50 spacious and informative slides. You finished creating your slideshow and you tweaked it until your fingers went numb. And, of course, you made sure to thoroughly proofread all your content. The final, and probably most important, step to making yourself and your company look more professional is to – wait for it – prepare and practice! If you are presenting at an event or in front of a live audience, be sure your slides have been saved correctly so they will be displayed perfectly, even when you aren't using your own computer. Often, issues with fonts, images or linked content can malfunction and – if not caught in time – can end up making you look sloppy. If you have to, arrive early to check with the presentation technicians that all of your slides will work exactly as you designed them. If your content is only going to be seen online, make sure you look at it in different browsers. If all else fails, save your presentation as a PDF. Always be sure to check that your presentation will look it's very best for your audience so that you can make the best impression. Prepare, practice and then... present!